This mod I was made for me for default map only. This mod made for best (on my opinon) view from inside truck cabin. Please no any request. Mod not be changed by your request. Mod provide as is without any warranty for correct work with your mods set. 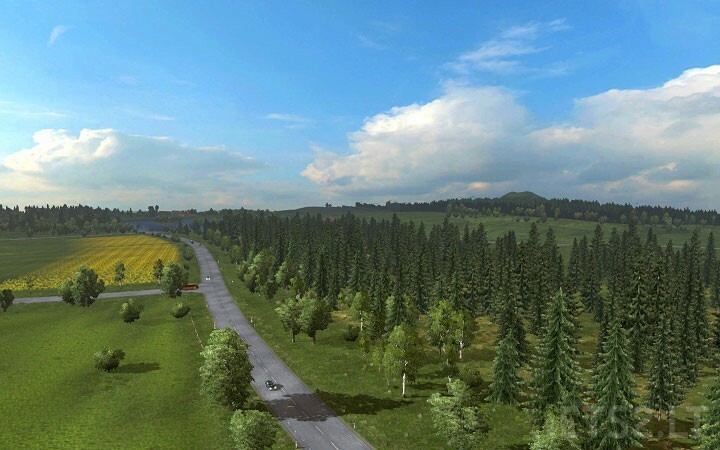 But mod contain climate zones sun profiles for use with ProMods 2.01 and EAA 3.1 maps. Tested climate change only. No test on real maps conducted. If you find out any errors with this mod on your mods set – throw it in the trash bin. Thanks PIVA by the new version of my favorite mod sky. I will add it to my blog. tnx but would this work with improved sound? or should i turn off the sound mod? I’ve tried the mod in the version 1.23.1.1 of Euro Truck Simulator 2 and it works perfectly without any failure. climate engine don’t change in this game update. I’ll wait for Arizona out. There may be added new climate, but the probability is very small. New climate will added for Oregon in ATS and when SCS decide make dinamic weather. PS, Why you don’t have blog for ATS, or I don’t know where it is? white sky it’s the problem of this mod with my opinion. ho do i can edit it in mod file?